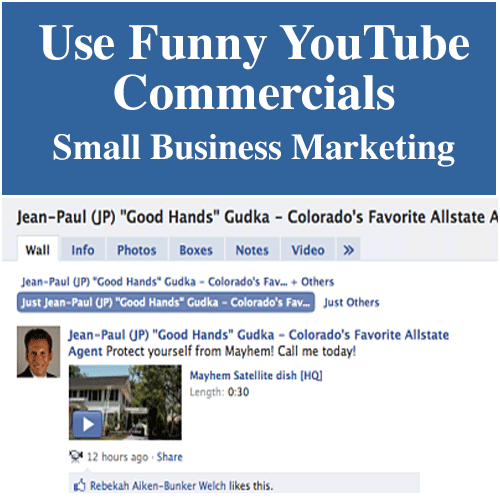 The easiest way to jump start your small business marketing is to use funny YouTube commercials for small business marketing. Piggy backing a funny YouTube commercial that a national company has spent GAGILLIONS to produce is a great way to help build YOUR brand! So how can we compete? Use their high priced commercials for our own marketing (with proper references of course – we are marketers NOT plagiarizers!) It is easy to find funny commercials on YouTube. Here are some marketing ideas that you can use for your company, even if you are truly a mom and pop with no parent company! 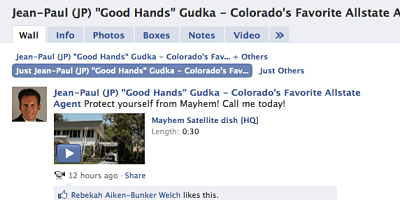 In the picture above, Jean-Paul (JP) “Good Hands” Gudka, an Allstate Insurance guy posted the Allstate Mayhem Satellite Dish video with the tagline on HIS facebook account “Protect yourself from Mayhem! Call me today!”. In addition to that YouTube video, he also has a “Storms cause major damage in metro Denver” and other links to pop media and current events around the Denver Metro area. NOTE: We are approached by businesses ALL THE TIME who are in the real estate, financial services and legal fields who are terrified to market. PLEASE understand that you CAN do fun and interesting things without compromising your integrity or putting your license in jeopardy! Those are just two examples, you can literally find HUNDREDS of funny YouTube Commercials that you could use as teasers to help market your business. All I did was do a search for “funny commercials” and got 174,000 results! For realtors – A funny commercial from My Realty.com – you could tell your prospects that you will even list it here for them! Long story short, most humans like funny things and if you use funny YouTube commercials for your small business marketing you can save yourself the time and trouble of producing them yourself! If you have any other good commercial ideas, please feel free to leave a comment!